West Fallowfield Township municipal offices are located at 3095 Limestone Road, Cochranville PA 19330; phone: 610-593-5916. Portions of the text below were adapted from a copy of the original National Register nomination document, 1990. Adaptation copyright © 2009, The Gombach Group. Established in 1813, the Joseph and Esther Phillips Plantation in West Fallowfield, Chester County, consists of a main house and five outbuildings, all of which, except the carriage house which is being restored, retain outstanding architectural integrity. 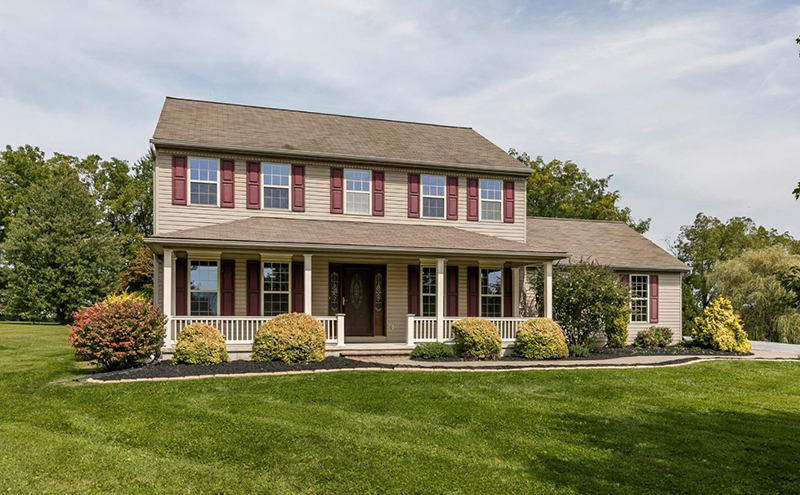 The farm is located on Bailey's Crossroads (Road), one of the township's principal roads that crosses the Octoraro Creek, the natural boundary between Chester and Lancaster counties. The plantation traces its southern-sounding name to an early 18th century regional tradition where farmsteads over several hundred acres were often called "plantations" rather than "farms." The original plantation included 307 acres, granted to Margaret Phillips by the federal government in 1793 as compensation for her late husband's military service during the War of Independence. By the mid-1800's, after the farmhouse and barns had been built, the property had been reduced to a 106-acre dairy farm and remained as such until the early 1970's when it was further trimmed to its present 7.8 acres. Nonetheless, the original plantation property remains as either farm or wood land. All of the principal buildings survive as well and stand on the west side of Bailey's Crossroads (Road), situated close to the house in a relatively linear pattern common to farm plans in this region. The exception is a carriage house which stands on the east side facing the rest of the farm. The plantation's principal building is the farmhouse, a two-and-one-half story stone structure built from local limestone. Its outbuildings consist of two, wooden-frame-and-stone bank barns; a stone, octagonal smokehouse (enclosed within a wooden farm shed); a wooden-frame carriage house and workshop; and two-story, stone springhouse. All of the structures survive in good condition within their largely unspoiled historical setting of rolling farm fields and wood lots that drain toward the Octoraro Creek to the west. If Isaac Philips had a trademark, it was the quarterfoil or clover leaf, similar to the ones he cut into the flat posts on the farmhouse porch. Local history has it that Philips was responsible for much of the gingerbread ornamentation that survives on some of the surrounding farmhouses in West Fallowfield. Indeed, several are reported to have the same distinctive jig-sawn motif. Philips, who was the youngest of three sons of Joseph and Esther, was born in 1826 and raised at the plantation. Like many rural people of his day, he knew both farming and its associated skills. But unlike his brothers, who farmed the family plantation, Isaac decided to become a wheel and coach maker. Possibly the influence of his father Joseph's blacksmithing operation led him to these trades. In his teens, Isaac apprenticed with a craftsman in Atglen, only several miles away, and later worked in local towns, including Black Horse and Ercildoun. In 1852, he established himself in business at the plantation after having inherited the family farm while still in his twenties. His skill at coach making eventually led him into cabinet making and other finished wood working. Artifacts, such as a blacksmith's bellows, tools and equipment, coach-maker's templates, and gingerbread molding patterns, jigs, coach springs, and rims for wagon wheels, were recovered in recent decades from the workshop. In his later years, Philips served as a justice of the peace, a public school director, a director of the Ephrata Insurance Co., and senior deacon of the First Baptist Church of Atglen. Philips lived at the plantation until 1902, when his wife died, then moved to Christiana to live with a daughter. The farm was leased to Roy A. Ritter, a neighboring farmer, who bought the property in 1908 after Isaac's death. The plantation remained in the Ritter family as a dairy farm until 1972 when it was purchased by the present owner. The remarkably short list of three family owners over the plantation's 176-year history accounts, in large measure, for its outstanding architectural integrity today.